Bacon is one of the most sought after foods in the entire world. Although not the healthiest food you could be eating, it certainly is one of the most delicious. People all over the world and all over the Internet have fetishized bacon almost to the point of exhaustion. I mean honestly if I hear one more person scream BACON at me in the comment section, or watch one more poor innocent meal get wrapped in bacon and deep-fried, I am going to burn my laptop and disconnect—just kidding, I wouldn’t last 15 mins without Snapchat or Pinterest. But alas, this trend does not seem to be going away, and so I must embrace it the best way I know how—Veganizing it. Growing up, I didn’t eat much bacon as my mother was a Seventh Day Adventist vegetarian and the Bible described it as an unclean food. But being a child of divorced parents, my dad would serve it with breakfast, and on a handful of occasions I tried it—but it never made it into my regular eating patterns. Growing up in the country by a vegetarian meant that we were often exposed to farm animals, and so eating meat just didn’t appeal to me. I think much of this had to do with this animal exposure but also my mothers strict views on diet and eating, She described pork, bacon, ham to us as animals, instead of food; so it wasn’t just a plate of bacon—it was a plate of dead pig. When it came to food, and slaughter, my mother was always very honest about where it came from, and made sure that we were always thankful. To many people this may seem like an odd way of parenting, but in hindsight, this type of honest parenting is what made me compassionate towards animals, seeing them as equals with intelligence, and drove me to eventually become a vegan in my adult life. For Vegans, the bacon alternatives are limited, and fail to live up to the standards that bacon lovers have come to expect. And let’s face it, most of us did not become vegan because we didn’t love the taste and smell of bacon, we became vegan because pigs are individuals that deserve love off the plate as well. Neuroscientists have studied and found that pigs share a number of cognitive capacities with other highly intelligent species such as dogs, chimpanzees, elephants, dolphins, and even humans. They are often compared to having the intelligence similar to that of a 3-year-old human child. So if you wouldn’t eat your dog or your toddler, you shouldn’t be eating a cute fuzzy piggy. As a society we have desensitized ourselves to what meat is and where it came from. And since we are a culture that very much identifies with food, and bacon as it’s own food group—I made it my mission to be able to look every “I would be vegan – but bacon” bacon-loving wannabe vegan in the eye with a piece of bacon and say, “Now you too can become vegan…” What is this magical bacon alternative I speak of? Making vegan bacon out of rice paper and a bacon marinade. Yup, rice paper, that stuff vegan up until now have been using to make salad wraps with. Blech. This bacon gets it’s favor from a marinade made with Tamari, olive oil, nutritional yeast, garlic powder, liquid smoke, and maple syrup. These ingredients together provide you with a smoky, salty and slightly sweet flavor very similar to bacon. This recipes does take a round or two of practice as the rice paper can be hard to work with, but trust me when I say; it is the BEST alternative to bacon I have tried yet! I didn’t come up with this concept, but here is my version. Try it wrapped around king oyster mushrooms, as an alternative to bacon wrapped scallops, or wrap it around a veggie dog and grill it, Bacon wrapped dates as a chic, sweet and salty hor d’oeuvres anyone? Anything you could normally wrap bacon around you can definitely wrap this vegan bacon around, you could even have bacon on your veggie burgers, in sandwiches or crumbled on top of your salad. Don’t be afraid to get creative. While it is impossible to truly duplicate the flavor of actual bacon I think this is as close as you’re gunna get! What are you waiting for? Get out that bowl, whisk, and rice paper and get cooking! In a bowl, whisk together all the ingredients except the rice paper. This will become your marinade. Once you've run our of space or rice paper- whichever comes first- using dry pastry brush (do not using the one you used for water- it will dilute the marinade) and brush the marinade onto one side of the now fused rice paper strip, and lay marinade side down onto the baking pan. Love it! I would love your recipe for your morning ginger shots! pretty good! i used smoky chipotle adobe sauce instead of liquid smoke and paprika but i think it took over. needs a tad more salt- cant wait to try again! Love it ..Can’t wait to have BLT sandwich. I just made these on a whim at 2 am, which is when all the best cooking happens. I really loved the texture and the idea but the sauce ended up tasting like nutritional yeast only. That is to say, I had parmesan cheese flavored bacon which I wasn’t really happy with. I’m excited to have this new technique of facon though! How did it turn out?! Yummers? It was really good,I used kitchen scissors instead of a knife because I was scared I would break the rice paper. I’m going to try this the next time I want to make bacon. I’ve been making my bacon with yuca and pan frying it. It comes out crisp and tasty and holds up well in the fridge. I do think that I will reduce the amount of nutritional yeast in your recipe. I want a smokey taste not cheesy. I will have to try the yuca as a bacon substitute! I am not Canadian but I agree! Maple syrup is awesome! This is getting me another step closer to finding a bacon substitute. Due to health conditions, my Dad was ordered “no salt” and he loved his bacon! Any ideas or substitute suggestions for the soy sauce? I am anxious to try this recipe. Hmmmmmm perhaps try balsamic vinegar? Liquid aminos are **not** a health substitute to salt! The company was actually ordered to remove their “MSG free” labeling because it has the same effect on your body as MSG. Coconut aminos is the lowest sodium soy sauce substitute I’ve found. And I have searched! 🙂 I’m a registered dietitian that works with heart patients and my dad has congestive heart failure. Oh my gosh! This looks insanely good and so real! I am not a fan of the eggplant and coconut bacon, so I will have to try this! Best vegan bacon I’ve tried!! Amazing. I made these last night and they turned out FANTASTIC! I enjoyed them so much that I forgot to take a picture. I made another 2 more batches and forgot to take pictures yet again because these are just too tasty to last that long. I eventually got a picture after the 4th batch, wow are they photogenic! I wound up making the most deliciously crunchy BLT I’ve ever had. THANK YOU, Candice, for helping to inspire me to go vegan, and for providing mouth-watering vegan recipes for me to try. I will be sharing this with all of my omnivorous friends to blow their minds. WOW!!!! 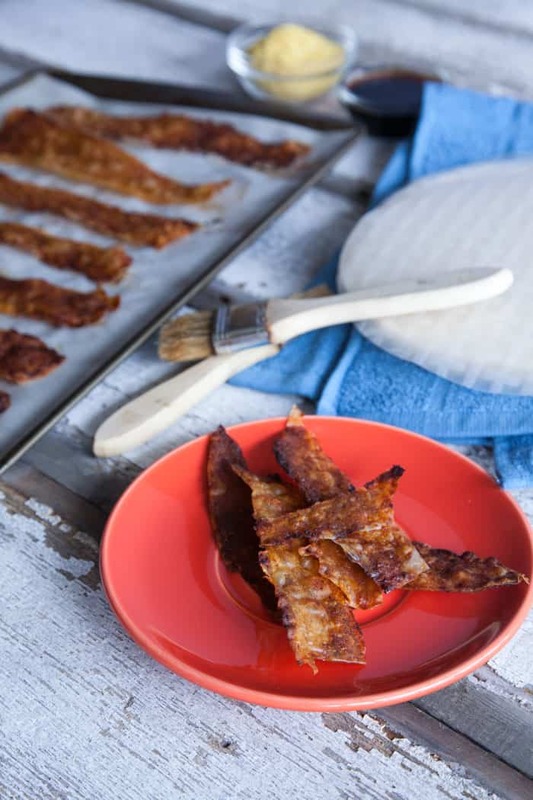 I love this account of your vegan-bacon-cooking adventure. I am so happy to be part of your journey! Welcome to the family! Hi, I usually make my vegan bacon with coconut and it tastes really good but doesn’t look like bacon. I will try yours soon. I made these but with brown rice instead of regular. I made it exactly according to your recipe and they turned out too crispy and so chewy you couldn’t pry it apart with your teeth. I tried various batches and burned a few as well as different flavors/water combinations. I found it was easier to paint the water on a full round piece, place it together with another and then put the marinade on. That way when you cut it the strips were even and thus cooked evenly. You just had to work quickly. I wouldn’t recommend the brown rice version but still good. I did however make the regular ones and they were delicious! I too left the rounds together and did what was suggested – two different basting brushes – one for the water and one for the sauce . Once cooked and crispy – i used my kitchen sheers ( scissors ) to cut into strips – it didn’t matter if the stips broke a little – STILL so deilcious. The BEST recipe for “FAKIN BAKON” I have tried – I have tried the eggplant and coconut – but nothing compares to your recipe. NB – store in the fridge in a baggie – I tried to keep them in the freezer – but not good – they get too “limpy” and I had to put them under the broiler to crisp up again. BEST tojJust store in a baggie in the fridge I ABSOLUTELY LOVE LOVE my 21st Century BLT’s. I have shared your recipe with friends who are going plant based as well. Keep up the great EDGY VEGGIE ness – you are awesome. I did the same, after not having any luck getting two layers to cut with a knife and had much breakage. But the dry, double layered rice paper cut with scissors was fast, easy and with little to no breakage. I started using the scissor method and it’s the best thing ever!!!! I’ve found the easiest way is to wet and stick two sheets together, brush with marinade then use a pizza cutter to cut into strips. Transfer to pan then bake. Perfect strips every time. It’s in a completely different language how could you assume someone stole a receipt from a Niue lol what a SJW. I have seen this method from various sources, I had no idea who made it originally. No need to assume we are all recipe thieves. OMG you are too cute. Thanks for the recipe, I am excited to try it as I am not to fond of the vegan bacon at the stores. Thank you for your videos. I believe it is in agreement with all Christian denominations…especially since it came from Jesus’ mouth. That verse was pertaining to calling the gentiles or “people” unclean. NOT FOOD. God changes not. I agree with you, Cynthia! His word WAS, IS, AND ALWAYS WILL BE the same. Brianna, you say you didn’t put your comment up for her to comment on… Good Christians are supposed to help each other with understanding what the Lord really says. What if you believe something was true, it wasn’t, and it cost you your salvation? What if another Christian knew you were wrong, yet didn’t correct you for fear you would be offended or upset? Who’s fault is it? Who loses their salvation- the first person, the second person, or both? I don’t need you to post my previous comment. It was only meant for you to see. You do need the oil to get this bacon to be as authentic as possible. If you don’t like olive oil you can use whatever oil you prefer. These are so freaking good!!!! My non vegan family loves these. It tastes exactly like real bacon and it looks like it too when it cooks. I made these and my Hubby and I couldn’t get enough. The BLT’s were delish. Thanks so much for your recipe. I had trouble at first getting them to stick together so I wet both sheets and stuck them before I cut them. As I’m a quilter I used a ruler and rotory cutter to cut them and it worked great no breakage. These had a great bacon-like flavor. At first, I took it out of the oven too soon for fear of burning it. It was chewy at that point. After cooking it a few more minutes, it became crispier and great for inside my Rice Paper BLT! I’m excited to have this option for those special occasions. This was really good! I’m super impressed! The only suggestion is to spread the marinade on with your fingers. This does a great job of creating those darker and lighter streaks that real bacon caused by the mix of meat and fat. SO FREAKING GOOD. I made a BLT with this and it was the best I’ve ever had. My carnivore bf thinks it tastes like fried chicken skin, but I don’t think that’s a bad thing in my book. This was amazing! I made it for breakfast yesterday. My 5 year old did not care for it but my husband and I both loved it. Great recipe. I didn’t have any rice paper in the house but did have dried bean curd, paper thin. I soaked it for a few minutes then drained off the water and painted on the mixture. It was probably stronger than rice paper would have been. It cooked beautifully. I now have a huge amount to put into all kinds of recipes over the next week or so. I’ve done a few vegan bacon recipes. This is by far the best, with a few personal tweeks. – Use a sharp knife to cut the rice paper. If there’s texture, put the texture side up when you cut. Just place the blade on the paper and bear down on it. Cuts pretty easy. – This recipe is SUPER salty. On the second go, I cut the tamari in half (1 1/2 tbsp), added more maple syrup (1 tbsp) and a 1 tsp of water. This made it taste much more like bacon. – This come out very crunchy if you watch the pan. I used a parchment lined baking pan..worked great. – For sticking the rice paper together. Just use a small bowl, run the paper through it once, then stick the two sheets together. Bond the sides without the texture and it’ll stick much better. – Use one swipe of marinade on the bottom, then flip, once swipe of the brush on the top and you’re done. Too much marinade makes it less crisp. I made this a few weeks ago and made a BLT for my hubby, he LOVED it (he is a carnivore)!! Win win!!! I just ate it plain, yummy!!! One question, can you make this a few days ahead and it will stay crispy???? I am having a vegan brunch for my boys and their ladies for Christmas and I want to make this, but i have so much to do, anything I can make ahead of time will be very helpful! Thank you bunches!! I’ve made it a head of time, you just have to keep it in an airtight container. If it does lose it’s crisp- just heat it in the oven for a couple minutes 🙂 I am SO happy that your family enjoyed this recipe!!!! This is great***** I cut the sheet of medium rice paper in four,that way there is some all over my sandwich.Eeven my husband likes this! So…you’re opposed to eating a pig, but scallops are still on the menu? I thought being vegetarian meant not eating ANY animals, not just intelligent ones. You’ve obviously mis-read. There were no scallops called for. Always a good idea to read & comprehend before making misleading comments. I finally made this! It is super crispy! My husband and I really enjoyed it. I also used scissors to cut the rice paper because my knife just wasn’t working. I think next time I might glue a whole strip together then cut afterwards, just to save myself the tediousness. Thanks for the awesome recipe! Definitely the best vegan bacon I’ve had! 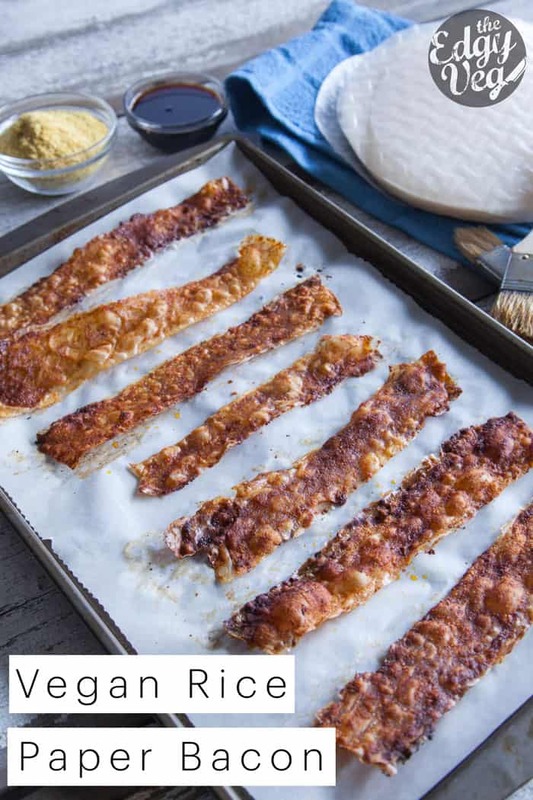 I really wish you would include a link to the original inventors of rice-paper bacon (laekon), which originated in Denmark (of all places, we have an insane pig industry, which was why the inventors went to work on this project). I know you have changed the ingredients a bit, but they still deserve the credit for the original idea. Mine didn’t have much flavor, I didn’t think it tasted like bacon, but it was very satisfying and felt like eating bacon. I’m not sure if I did something wrong or not with the Seasoning. I’ve not tried a vegan bacon I like, but this one is great! I’d have never thought to use rice paper for this. We’ve just tried making these, and after cutting the first strip from the hard rice paper rounds I decided that I’d wait and cut the rest after brushing it with the water and flavouring. This was so much easier – especially when I switched from trying to cut it with a knife to using a pizza cutter. Then it was a breeze! Oh heavenly goodness, I just made this and died a little… I used onion powder instead of garlic powder though, and totally forgot the maple sirup, it was delicious nonetheless. This with scrambled tofu… I can’t wait to have that. Thanks for the recipe. OVERRATED! I turned out to be a rice ‘chip’. Seriously, it’s a barbecue chip, or strip, that is made out of rice paper! Thank you edgyveg for the inspiration though. After reading all the positive comments, i decided to try this again. This time i lowered my oven to 350 and baked for 6 minutes. I also used the scissor tip and and excited to say they came out wonderful! Thank you for sharing this recipe!! Very nice recipe and it is so easy to make at home. Very awesome recipes. Looking very delicious. Thanks for sharing such a wonderful recipe. I will definitely try it. Please share some more yummy recipes like this. I just just pulled it out of the oven! I was sceptical but this is yummy! I wish it was a little thicker as thats how I used to like my bacon… might try your marinade with tofu slices. Could you use 3 stipsof rice paper for added thickness? I was just wondering if it would work. I just made a batch and my bacon loving husband and bacon loving friend both thought it was awsome!! Love this recipe. Is i much easier though to cut with kitchen scissors and so much faster! I just wanted a bacon alternative recipe, not some lecture from a spoiled out of touch white girl filled with junk science. What a snotty comment, Lo. Does everything you read have to align with your beliefs? You must feel really out-of-pocket on this free recipe. OINK! Oink oink oink oink oink oink oink oink! I just cut the rice paper with scissors! So much easier and doesn’t crack at all! Great recipe! Thank you! Hi, I just tried making this today and while the rice paper idea was great, I really wasn’t a fan of the sauce. I don’t know exactly what it was, but the taste was off to me…maybe because I’ve only been eating turkey bacon for years, which has a much subtler flavor, and the marinade made it taste very porky? I was wondering if you might be able to suggest some alternative marinades because I think the rice paper bacon itself had the right texture, more or less, and would love to be able to make use of it! Thanks so much! Hello this is a great recipies. I made a change in the way of doing it. I place a rice paper sheet on a cutting board. With my hand I put some water and scrub until all the rice paper sheet is wet, after that I put the second sheet on top of the first one and scrup again. after that I brush the sheet with marinade and cut with a cisor and put on the cooking plate and brush to other side. I just made this vegan bacon to take to a brunch tomorrow and it is fantastic…I feel like a wizard! 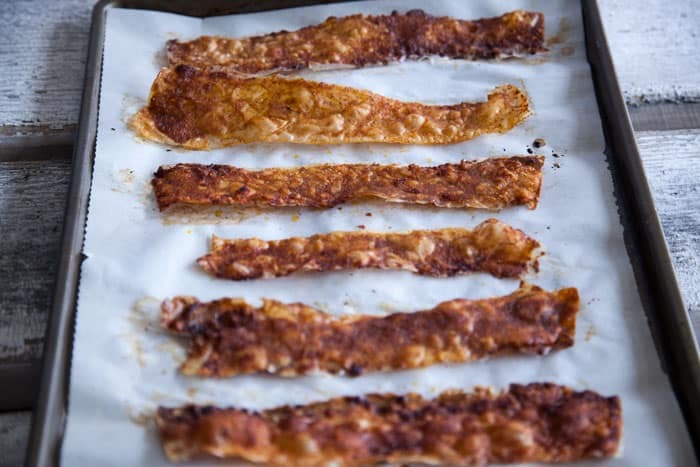 Making crispy tasty ‘bacon’ with rice paper…who would have thought…and it was so so simple and inexpensive. Thank you so much for this great recipe! My future sandwiches are never going to be the same. I love how crisp it is, so it can also be crumbled on a salad or to top a casserole…so many fun things! I didn’t follow your recipe exactly but I did follow your instructions — and WOW. Thank you! So easy. So tasty. This bacon has a BITE! I bet these will also make great bacon-wrapped dates. (I’ve honestly never understood the appeal .. but it’ll be a great snack to make for omnis, for sure.) Next time I’m adding some heat! Also, I don’t use liquid smoke (just can’t stand the smell) but I do like to add mesquite & maca to my tempeh bacon so that’s what I did here. Anyway, these are perfect, delicious. Will definitely be making these again & again. Im SO glad you loved it!!! Brilliant. I was craving BLT and had all the ingredients so I figured I’d give it a hoon. I misread the amount for the syrup and only put in 1/2 tsp. I just made enough for my sanga and chucked the rest in the fridge so when I use it next I’ll put more in. Other than that stuff up I reckon it was bloody close to how I remember bacon tasting, plus it was the perfect amount of crunchy and greasy (I did the second way) and didn’t leave me feeling oily and bloated like the real thing. It went great with lettuce, tomato, avo and scrambled tofu eggs. I’ll defo be making it again. Hi , I would love to make your recipe but I have a question. I can’t eat nutritionnal yeast (none of the products are gluten free where I live) Is nutritionnal yeast essential to the recipe? ahhhh! sorry, the produts are not gluten free! you can leave out nutritional yeast if you cannot consume it. I love the concept, and strips came out looking like and feeling just like the bacon I remember… something about the marinade though didn’t work for me – I think either the paprika or garlic powder burned? I’ll play around with it, but this is a great base to start from! I can’t find Tamari or Hungarian Paprika ? So substitute Soy Sauce and regular Paprika ? fold it and it pulls apart clean with no breaking !!!!!!!!!!!!!!!!! Those ingredients sounds just fine! Let me know how it turned out. We just finished updating our links so they should work now. Your ingredient links are going to makeup sites now — your original sources must have moved. We’ve got it all fixed now! Let us know if you have anymore trouble. Just an FYI – all of your links on the ingredients list take you to a nail polish website KL Polish. Thanks for letting us know! We fixed it. I made the recipe it definitely looked like bacon but they were so chewy you had to chew it forever and they had the taste of like a plastic taste which I think is the rice paper taste. I don’t know if I’d try again it was time consuming. I couldn’t see putting it in a veggie burger or wrapping it around things.. I just wasn’t a fan. But the look was 10/10. I ruined these! 🙁 Don’t know what I did wrong, but the vacon turned out to be so chewy that I couldn’t bite it or eat it at all. But the marinade tasted very good, though! Have to try again sometime with that scissors trick. Great bacon sub. Another technique to cut the rice paper…. take two full sheets and wet them both then place together a couple of minutes. They fuse nicely and soften enough to cut without breaking. I then coated and baked per recipe. For those that like spice, this was the last missing component for me to make vegan BBQ pulled pork stuffed jalepeno peppers wrapped in bacon. Yummy. Wow I must say your mother sounds like a great mom, i don’t have kids yet but when I do this is exactly how & want to show my kids. We do Not need to survive by killing So many innocent, hepless & sweet animals as they are living beings as well!. Thank you So much for this recipe I can’t wait to make this!! Thank you so much, Ashley! Let us know how its goes! Just made this and it turned out so good! It looks so much like bacon from a distance that I could fool people. It’s not exactly like bacon taste-wise, but the flavor is amazing and I love it. I’ll definitely be using this same marinade recipe for tempeh and tofu 🙂 I slightly wet the full sheets and stuck them together before cutting into strips, like some others recommended. Also, cutting in a horizontal motion will not work, you just have to apply pressure to the knife and it will cut easily. Good to know Lee! Thanks for sharing. I’m looking for a bacon substitute for my vegan “clam” chowder (made with oyster mushrooms and cashew cream). Will this one fall apart in the liquid? Hi I just wondered if its possible to get an estimated kalorie amount for a strip or a batch?